Many home owners regularly clean their windows but pay little attention to their window screens. 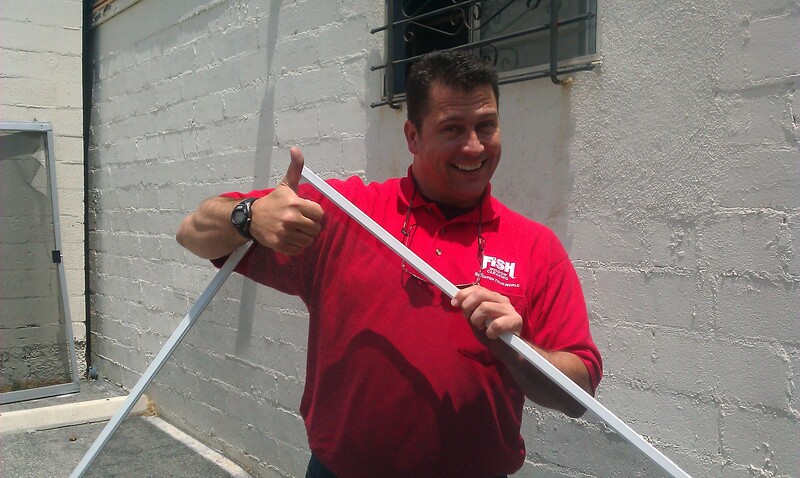 One big reason my wife Cynthia and I got into the window cleaning business is because everyone loves clean windows. One big reason we almost didn’t get into this business is because of window screens. 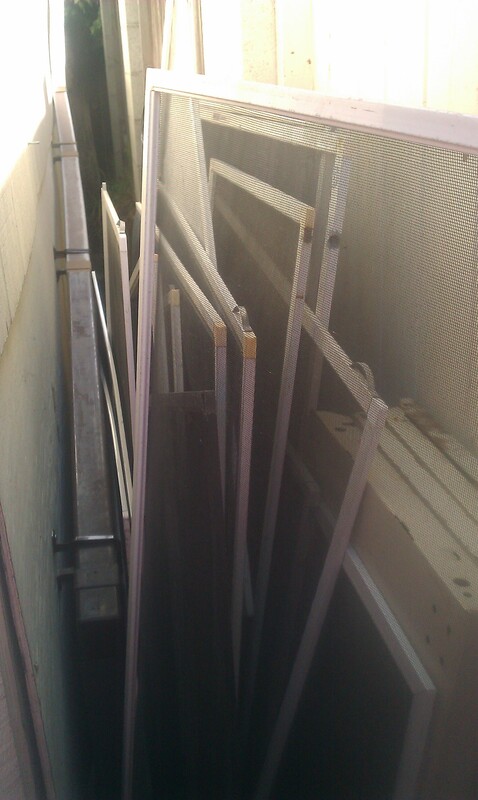 Working with residential window screens is a basic, necessary part of our jobs as window cleaners. We work with them every day and have become quite adept at dealing with them. We even smile and maintain a professional demeanor while cleaning and handling them. But we don’t have to like window screens. 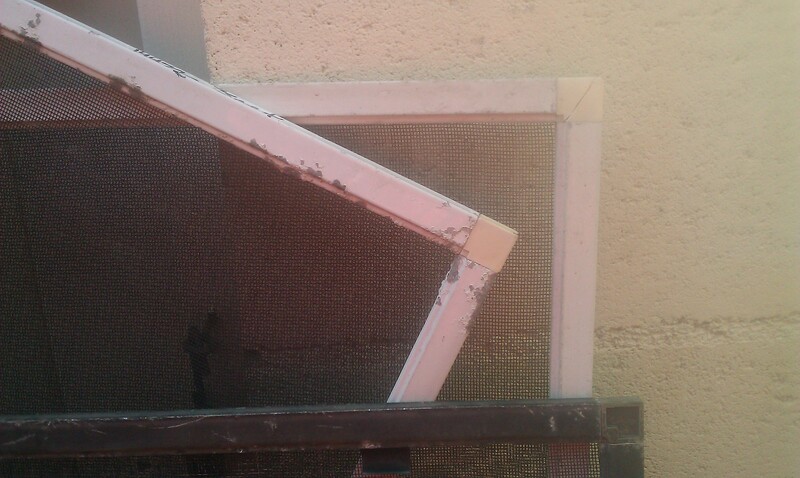 Window screens are often neglected and replaced infrequently and become brittle over time. Once the neglected screen is touched and/or removed to clean the window, many fall apart right in your hands. And whose hand is touching the screen? When Was the Last Time You Noticed Your Screens? Do Your Screens Look Like This? One of my first blog posts was “How Often Should I Clean My Windows? (Dec 2011)” because it is my customers’ most frequently asked question. I followed it with “How Often Should I Clean My Awnings? (Jan 2012)” because it’s the #2 question I hear most. 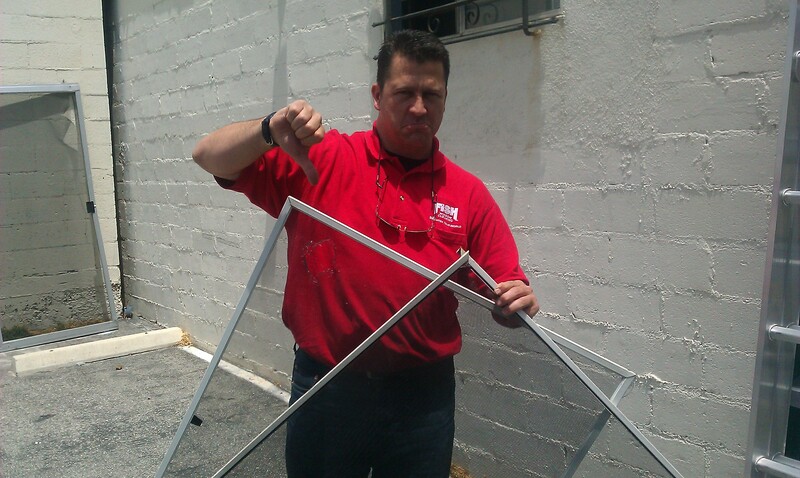 The #3 most frequently asked question, and today’s topic, is about one of my least favorite subjects, window screens. 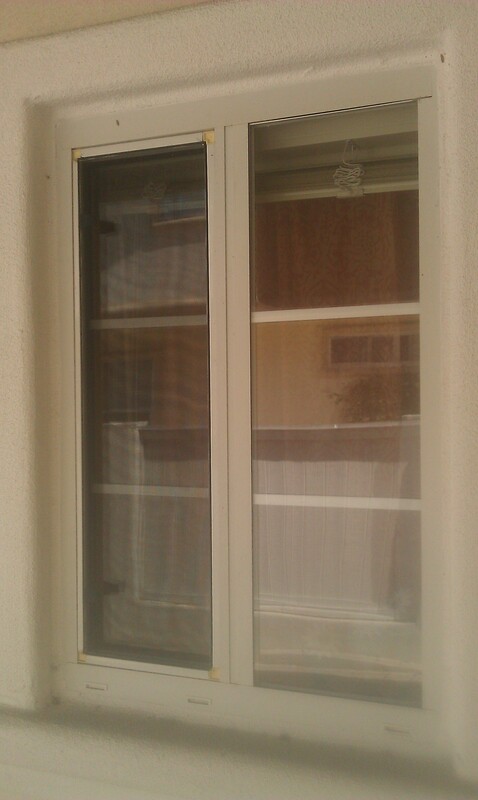 When we clean residential windows we always remove, clean and replace the screens. It’s an important element of professional window cleaning and just part of the package. It’s easy to notice homeowners that pay attention to their windows and screens because every window works and the screens are all in pretty good shape. Or Do they Look Like This? Do we wish all customers were like this? Yes. Is this what we see in the real world? No. Quite often, the only time homeowners even notice their screens is when they finally get around to cleaning their windows. 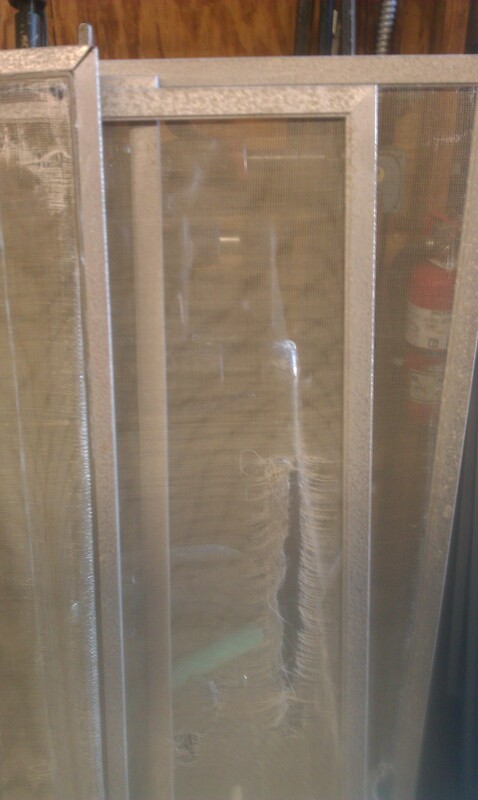 Infrequent window cleaning is one thing, dealing with neglected and corroded screens is rarely done before they break. Herein lies my issue with screens. As with most things in life… it depends. There are a number of structural and environmental factors that determine how often you should replace your window screens. Structure – Is it well-built or kind of flimsy? Usage – How often is the screen moved or handled? Add 5 -10 years by maintaining your screens regularly! So, no one answer will fit every screen. It depends. OK, so how long should a screen last? A normal screen that is primarily in shade, remains relatively dry, gets cleaned semi-regularly and is not subject to lots of handling (except at window cleaning time) should last you 10 to 15 years before it begins to break down and need replacement. With regular maintenance and care, you can add 5 to 10 additional years to your screen’s life. Check plastic corners. If they look faded, the plastic is getting ready to break. Replace. Inspect the spline to see if it’s coming out of the frame, use a spline tool to press it back in. In most cases, maintenance costs are less than replacement costs. You can do most of these tasks yourself and save money while keeping your screens in working order. One note: When we surveyed our customers, we found that cost is not generally the reason for infrequent maintenance. It’s the time and hassle. If you are not a Do-It-Yourself type of person, your local hardware store can inspect and maintain your screens for you. You just have to bring the screens into their store. 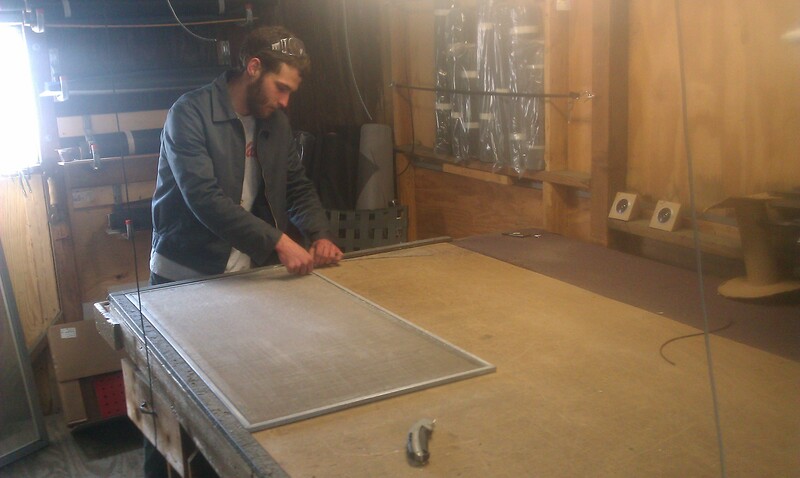 Also, there are also many excellent on-site screen companies that will come to your home and maintain them on the spot. These companies tend to be a little more expensive, but they really reduce the time and hassle factors for you. Whatever method you choose, regular maintenance increases the life of your screens. Over the last couple of years, we’ve unfortunately had dozens of situations where a 20+ year old screen falls apart in my cleaner’s hands and the customer, rightly so, asks what we are going to do about it. Yep. We touched it without noting it first, and we now own it. And, as a professional service provider, we replace it for the customer free of charge. Here’s a helpful tip to prevent customer/service provider issues before they happen. Quick Tip: The next time you have your windows cleaned, talk with your window cleaner before they start, and ask them to inspect the screens and indicate those they recommend maintaining or replacing. You both can then determine how to handle any repairs and/or replacement. This up-front communication saves a lot of headaches and reduces the possibility of “after-the-fact” situations. Be safe and have a great weekend! How Often Should I Clean My Awnings? Most home owners and business owners pay regular attention to their windows but we find that awnings are sometimes forgotten. Do Your Awnings Project a Positive, Healthy Image? 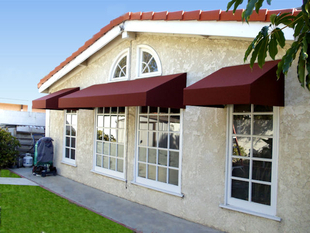 Well, your awnings are “front and center” for your house guests and/or customers to see. And yes, they do notice. Thanks Jennifer, great question! Well-kept awnings are important for making a great first impression, but did you know that cleaning them regularly also helps them last longer? The following recommendations apply to most types of commercial and residential awnings, back-lit awnings, canopies, gazebos, patio coverings, signs and shade structures – including canvas, vinyl, metal and other materials. As always, contact your manufacturer and/or installer for detailed information on the care and maintenance for your particular awning. So…How Often Should I Clean My Awnings? 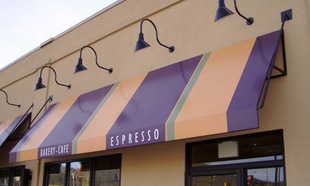 Awnings can be expensive and regular cleanings and maintenance help protect your investment. I recommend cleaning your awnings every 3 to 6 months to remove dirt and debris and prevent mold and pollutants from embedding in the material and causing premature deterioration. The longer dirt remains, the more likely the stains will become permanent. Also, the brighter the awning, the more dirt it shows. If you have light-colored awnings (yellow, white, stripes, etc.) , you should consider cleaning your awning every 1 or 2 months. Professional Cleaners use various techniques, including water-fed poles, industrial detergents and sometimes good old soap and water to remove dirt, mold, pollen, mildew, fungus, bird droppings, etc. that can, over time, deteriorate and break down your fabric, seams, and bindings thereby shortening the life of your awnings. Ask your cleaner to check for tiny holes and rips, and also inspect the metal structure and wall fasteners too. If they find some issues, call your awning provider to make these minor, cost-effective repairs before they become large, costly ones. You’ll prolong the life of your awning and save money in the long run too! Remember: Cleaning is Not Restoring. Regular maintenance keeps your awning clean and helps slow the deterioration process, but once your awning is “neglected,” cleanings only do so much. If your awning has not been cleaned in years and it’s really faded, stained and dirty, even advanced techniques and solutions may not be able to restore your awning to it’s “New Look”. Quick Rule: Set your expectations on how proactive you’ve been. 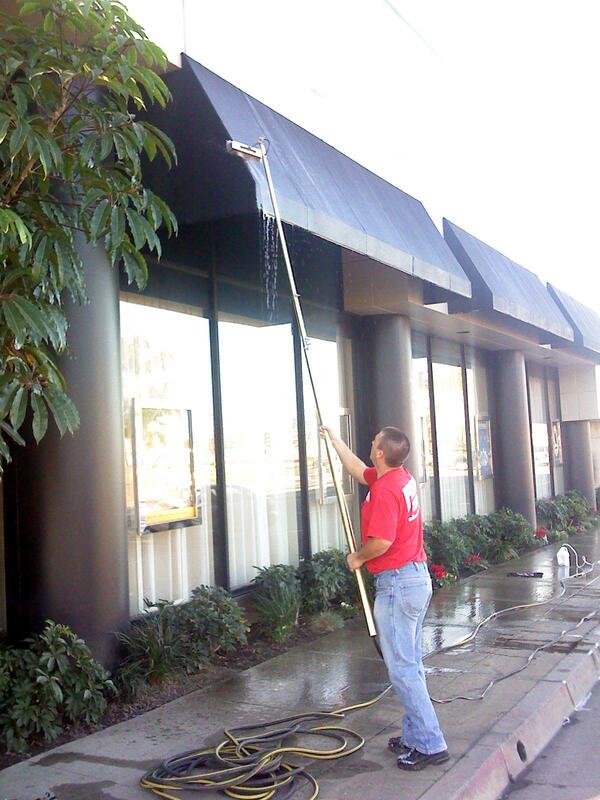 That’s why starting a regular cleaning & maintenance program for new and existing awnings is highly recommended. Protect your investment by scheduling regular cleanings and inspections to keep your awnings safe, clean and looking great! Top 10 Reasons to Clean Your Awnings! PROJECT a positive, healthy image. REMOVE embedded soil, grime, mildew and pollution. REDUCE fading and color loss. ENHANCE advertising value and professionalism. SAVE MONEY replacement costs are what?!? FEEL GOOD as you make a great first impression! 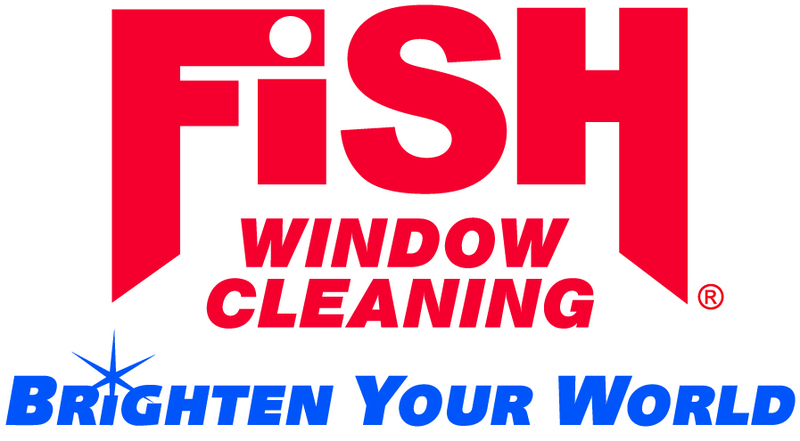 Fish Window Cleaning is a National Franchise with 220+ franchisees located throughout the United States. FWC corporate headquarters are located in St. Louis, MO. John Gran and Cynthia Julian own and operate the franchise located in the Los Angeles – South Bay, providing residential and commercial window cleaning, gutter cleaning, chandelier cleaning, pressure washing, and more. Click Here or Call 310-973-3474 for a Free, on-site written estimate. If you like this post, please click the button to “like” our Facebook Page and follow us!